Network Rail's stoneblower pictured shunting into Millburn Yard, Inverness on Friday, 12th April after returning from Georgemas Junction. What does a stoneblower do? Well, this is how it is described on Harsco Rail's website: "The Stoneblower is a revolutionary machine developed specifically as an alternative to traditional tamping methods for the restoration of track's vertical and lateral alignment. The machine utilizes a process which pneumatically injects ballast under the sleeper to achieve track positioning to an accuracy of 1.0 mm without disturbing the pre-existing compacted foundation. The result is a smooth track surface which is immediately available for unrestricted line speeds. 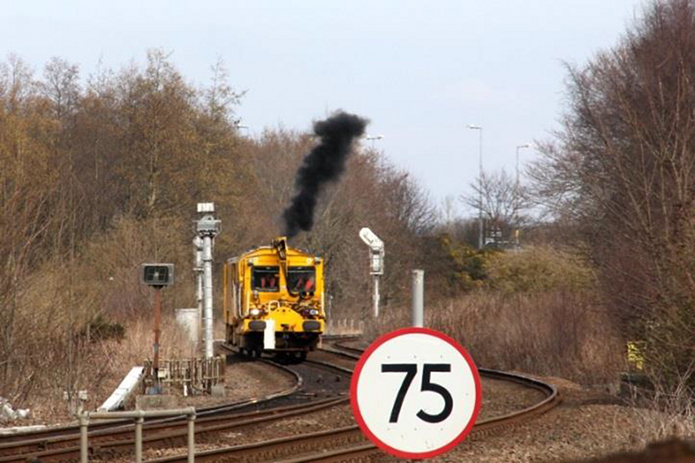 The Stoneblower is the culmination of many years of research and development by Harsco Rail in cooperation with Network Rail. The machine has undergone extensive testing to meet demanding requirements and has demonstrated the ability to significantly extend the time required between track maintenance cycles." Unfortunately, the other thing it did on the day it was photographed was to fail near Brora and make a mess of the FNL for the rest of the day. This just goes to show how delicate a timetable that operates over long single-line sections is. Surprisingly, it does not use coal as its fuel.